Cigars On The Porch: We Can Flush!!! 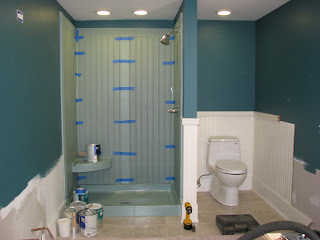 Note the really cool shower seat...and the blue is just tape holding the trim until the adhesive sets. This is starting to look like a real room! Yay, Joe! And the plumbers! It's gorgeous! I *love* the color. I finally got to catch up on you, and no you don't only have two readers, I've just been addicted to Ravelry lately.